How far away the goal posts are that called us to the play. Coaches, Athletic Department support staff, community support, fan support, a diversity of mentors, Eminence Outliers, warriors, the ‘difference makers’, character kids, a vocal & non-vocal leader mix, free spirits, family, The Lincolnites, opponents. The North Field House locker room, South Stadium locker room, The Pit, Grass Practice Fields, Memorial Stadium, Weight room, Hewitt Academic Center, Training Room, Training Table, Dormitory Parking Lot, Downtown on ‘O’ Street, Tokyo, Japan. Offensive multiplicity, competent communication, the joy of playing the spoiler, task simplification, negative motivation, The Motor, the walk-on program, positive peer influence/leadership, preparation, new technology, off-campus bonding, breaking others’ will, defensive scheme change, friendly picking on others, nicknames of acceptance, lack of excessive ego’s, fights on and off the field, maturation, lasting servanthood, the Girthing, repetition. Commitment, accountability, reciprocation of respect, sacrifice, roles, humility, vision, legacy/tradition, belief, competition, dominance, family, Positive Mental Attitude, present-day focus, recognition, revenge, role awareness, sacrifice, trust, unity, vision, a sense of urgency, resolve, a sense of destiny. I like this list and look forward to embellishing it with what we come upon in later chapters. Al Papik: No problem at all. AP: I’m from Nebraska. I attended Crete High School and went into the service and had two years of military duty, and enrolled at Doane College and played 4 years of football there. Leaving Doane College, I started out teaching and coaching at Laurel, Nebraska, then went to my hometown, which was Crete, Nebraska and coached the football team there for two years. Then went to Doane College and was the athletic director, head football coach, and head track coach for 17 years. Then I went into administration at Doane College for one year, was Director of Admissions and Administrative Assistant to the President. The following year, the fall of 1974, I took a position at the University of Nebraska as Director of Admissions. Q: How was the transition from coaching to administration? AP: Well, it was an easy move. It was an easy transition because my years of coaching at Doane College. Working for a small college, the head coach does the large majority of the recruiting, so I was quite involved with admission activities and actually assisted the department in the general recruiting and the processing of students. So it was a smooth and easy move. Q: How did you come upon making the move to the University? What precipitated that? 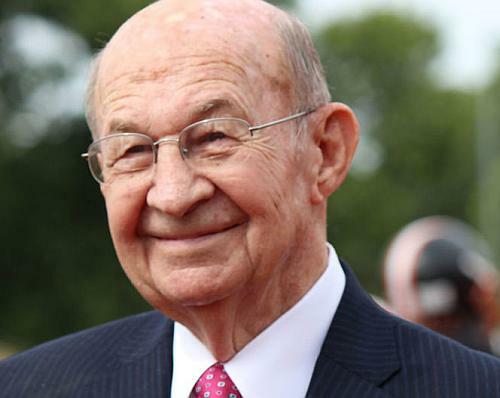 AP: Through the work I was doing at Doane I got to know the people that were on the road representing the university and became well acquainted with Bob Devaney and his staff. (And even before him, with Bill Jennings and his staff, too.) And they’re coaching 25 miles away, so our paths crossed quite a bit. The Nebraska admissions office had an opening, and I found that a number of people in the admissions office were involved in athletics as far as determining eligibility requirements, working with the Big 8 Conference on initial eligibility and continuing eligibility and that sort of thing. They called and recruited me, so to speak, and wanted to know if I would be interested in an interview, and I went up there and accepted the job. And for 12 years I served as Director of Admissions before I went over to the Athletic Department. AP: That’s right. Tom Osborne was an outstanding small college athlete in the state of Nebraska. He played at Hastings High School, stayed in Hastings and played at Hastings College. Doane and Hastings were traditionally rivals, and he, of course, had 4 years that he was an outstanding athlete there. We had them on our schedule each and every year. Q: Did you try recruiting him to Doane? AP: No, I think it was a pretty well done deal already. (laughs) His father was very involved in Hastings College as a supporter of the institution and everyone knew that Tom was going to go to Hastings College in the later part of his high school career. AP: I’m not sure it was his first coaching job, but I think you’re right. Bill was an assistant coach and a line coach at Hastings College when I was coaching at Doane. He came from something like South Dakota, I’m not sure. But yes, he did serve for some short period of time, and I’m not sure of his length of service, but much more than one season. Q: Was there anything about Tom Osborne as a college player stood out to you? He was the quarterback. Tom McLaughlin was his head coach and used him very effectively. He had that ability to throw the ball and throw the ball deep. But he was also a running quarterback, so they utilized his athletic ability to a great extent. They had some good years when Tom was playing for them. Q: A lot of play-action stuff, in other words? Q: So you were in Admissions at Nebraska, what brought you to the athletic side? AP: I think it was the relationship I’d developed with Bob Devaney. The Shrine Bowl game there in Lincoln… every year Doane College was the South Shrine camp’s site for about two weeks of training for that particular game. Well, I was the camp director for it, and Bob would always have his assistant coaches around. So there was a lot of give and take between the University and myself, and I knew the staff and a number of assistant coaches. And of course, Tom Osborne became a part of Bob Devaney’s staff, though we had established a relationship there prior to his involvement with the football program. Q: That fall of 1974 when you joined the University was Coach Osborne’s second year as a head coach… any recollections of seeing him as a player first and then years later as a head coach? Any impressions of his maturation? AP: Well, Tom was doing his graduate work at the University of Nebraska while he was assisting Bob Devaney. And Tom and a number of university athletes who went to grad school and were undergraduates had a basketball team; they’d travel around and they came down to Doane College on occasion, so I had an opportunity to visit with him when he was a student. And, of course, Tom approached Bob about being on the coaching staff, and Bob saw a lot of potential in him and gave him the responsibility of working with student athletes from an academic point of view: if athletes were having academic problems, to prevent any academic problems, to be sure they received academic advising, to be enrolled in the proper program. And out of that grew an academic advising program at the university that was second to none in the late ’70’s and through the decade of the ’80’s, where a program headed up by Ursula Walsh started to get a lot of national recognition for having large numbers of students graduate, having a high grade point average and a large number of Academic All-Americans. The impetus started there, of course. And Tom, when he was named head coach he put a great deal of emphasis on having a program that was solid and had the facilities and support and worked within the confines of rules and regulations of the NCAA. I think that Nebraska took a leadership role in the kind of emphasis they were putting in academic support for the student-athlete, and that was shown in the facilities, the Hewitt Academic Center, and the number of staff that were involved in the entire program for all sports, men and women. And when the Unity Council was established, that was also one of the issues that maybe led the country at that time. I think Nebraska was doing more than a vast majority of colleges in that area. (I thought that it wasn’t just Jack Stark that created the Unity Council, but Tom had a Unity Council going before that.) He also did a great deal with psychological counseling, to get sports psychologists to assist the coaching staff, working with the coaching staff and with the student-athletes in the roles they would play. He felt those would be a significant contribution to performance on a Saturday afternoon. Tom was able to get so many staff areas to support his goals: to recruit a good number of football players (the kind who would stay with us for the 4-5 year period), the kind of staff who would be able to coach them up to where they could compete for conference championships. He had a vision that took a great deal of support. He had to make sure he had the business office, the strength training complex, the food service, the sports information, the academic support, the ticket office, that everybody was involved in this. And each year to start off the season there would be a meeting with all the appendages the student/athlete would touch or who would have an affect on the football program, emphasizing that we were “all in this together and we need to think alike and support each other and have a role in the culture of this program as to what we’re trying to accomplish.” Tom had that kind of ability. Of course, Bob Devaney had a real sense of collecting a very diverse, but a very effective staff, too, whether it was coaches or support staff. And initially Tom was able to, of course, keep some of those people, the majority. And then Tom was able to surround himself with the people who stayed with him a long time and were very capable and bought into the system. He really developed things behind the scenes. That was very easy to spot, how and what Tom was doing and what his objectives were, how he went about ensuring what was to be accomplished. Q: So from the beginning he seemed to have a wonderful organizational mindset? A grand vision? Q: Looking back and witnessing how the program operated under Coach Osborne’s vision, was there anything you wish you would have done during your stretch Doane? Anything you wish you’d implemented those earlier days? AP: Well, those are two different creatures: coaching at a small college and coaching at the University of Nebraska. We did have an opportunity at Doane during my last few years of coaching where we were very successful. We actually, toward the end of my tenure, went four straight years without losing a contest. AP: The first year, 1968 -I’m not even sure of the exact year now- maybe it was ’66, we had an undefeated season. And I wasn’t aware of that, but it was the only undefeated season ever in the history of the institution. And we then had 4 consecutive seasons of being undefeated. So they allowed us, a small college, allowed me at least to leave the state and do a lot of recruiting in the Chicago area and a spot in Texas where I had some contacts, and Pittsburgh, so it was quite obvious that you could win football games if you can recruit talent.